On 11 February, delegates from across the business world descended on central London for the annual Global Recruiter UK Summit. Taking place at the brilliant 30 Euston Square venue, the conference featured guest speakers from across the recruitment industry, including representative bodies, members of government and recruitment specialists themselves. Chaired by Chairman of APSCo and Recruitment Sector Investor, Miles Hunt, this year’s conference focussed on the topic of evolutionary recruitment and the adaptations recruitment companies must make to access the widest possible talent pool and ultimately stay ahead of the curve. 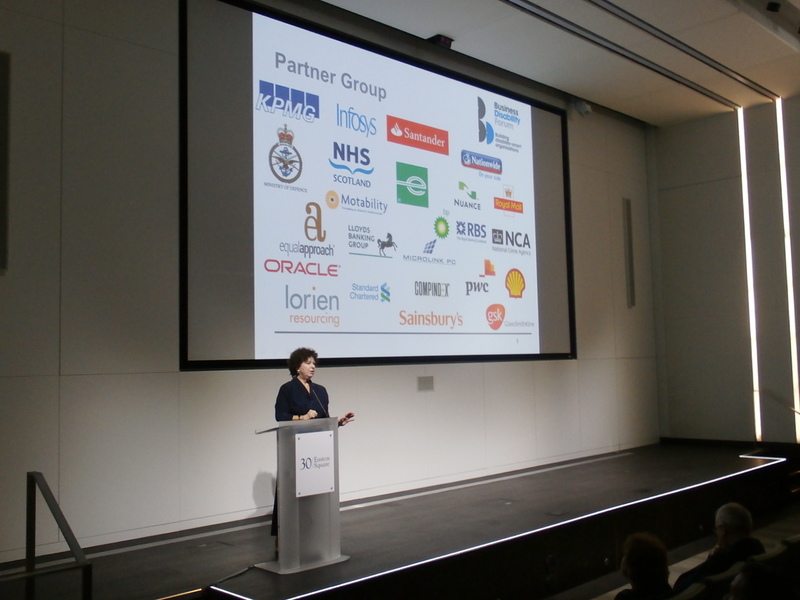 Joining a wide range of experts and industry leaders speaking at this event, Business Disability Forum (BDF) Founder and CEO, Susan Scott-Parker gave an engaging and eye-opening presentation to delegates entitled ‘Revolutionary Recruitment’. Speaking directly to the wide range of recruitment industry representatives present, Susan’s presentation established the ways in which recruitment companies will best meet their client’s ultimate goal of accessing and attracting the widest talent pool by changing how they operate. By becoming increasingly disability confident and incorporating accessibility into each and every stage of the recruitment process, organisations will place themselves in the best possible position to attract, recruit and retain employees from the broadest possible talent pool. This process begins at the very beginning, from making online applications accessible to disabled people, to the ways in which potential candidates are contacted, all the way through to the interview process, offering the position and finally, taking on new employees. Speaking in her engaging signature style, Susan began the presentation by asking to stand, those in the audience who could. Once standing, Susan began to read aloud a list of disabilities and asking audience members to sit down if they themselves or someone they knew had any of the disabilities noted. Before reaching the halfway point of the list, all audience members had already returned to their seats. This simple task immediately illustrated the fact that disability is not a peripheral or minor issue, but something that affects the large majority of us in a variety of different ways. “If recruiters and recruitment companies make it easier for their employers to ensure that their procedures are accessible to people with disabilities, then everybody wins a balloon”. Firstly, ensuring candidates with a visual impairment can easily read the company’s online database and publications. This is particularly important when making adjustments for an aging workforce such as that in Britain. Furthermore, ensuring that your company website is fully accessible to the 10% of the workforce who have dyslexia so that they can use your company’s online application service successfully as opposed to taking their business elsewhere. In terms of communication, ensuring that applicants are provided with a number of different ways in which to contact the employer so that candidates with a hearing impairment for example can easily apply for the role. And finally, ensuring that your premises and your client’s premises is physically accessible to people with a disability. This could be as simple as installing a ramp where there are stairs or installing automatic doors to aid wheelchair users. To close, Susan ended with a discussion on the importance of changing attitudes. Whilst making your business accessible to people with a disability is vital if you are to succeed in reaching the widest possible skilled workforce, you should not need a business case to treat people properly and fairly. This entry was posted in Post-event round up and tagged accessibility, APSCo, barriers to employment, Business Disability Forum, global recruiter summit, HR, recruitment, Susan Scott-Parker by disabilitysmart. Bookmark the permalink.